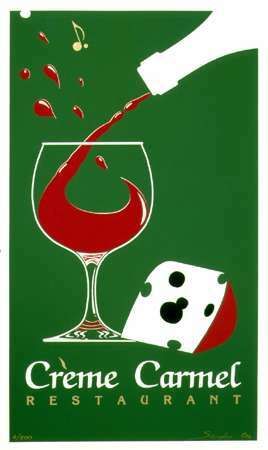 During the 80's Jeffrey Sax published a number of limited edition serigraphs. He also developed a body of work with chalk pastels using a unique process. These pictures are a fusion of traditional serigraphic style, combined with his own chalking technique. The silver ink is silk-screened first. 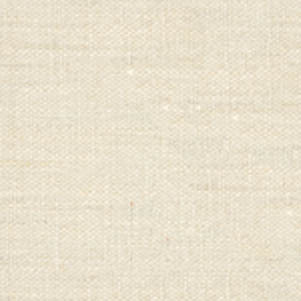 Then the edges of the French pastel paper are hand-torn. Lastly, each print is hand-colored and then signed and numbered by the artist. 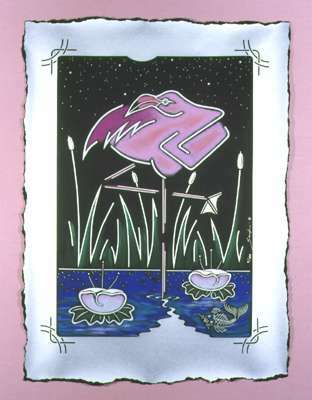 The Flamingo as subject matter inspires feelings of Peace and Grace. Tillie Gorts is Monterey's most popular and longest lasting "almost vegetarian" restaurant originally founded by Gil Tortalini. 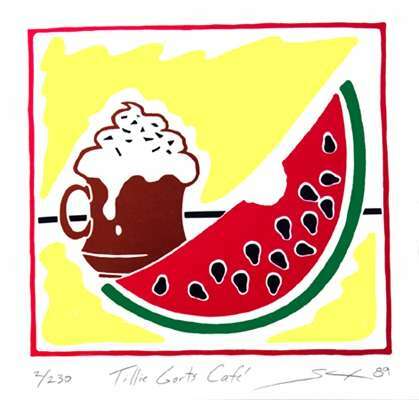 The image of watermelon and a hot winter drink suggests that it is a warm cozy spot in the winter, and a refreshing fun spot in the summer. Simple food, and to the point. They also used the image for their menus, business cards, and T-Shirts until the restaurant was sold. Crème de la Crème was commissioned by Jay and Anne Auburn to celebrate their very successful pastry business. 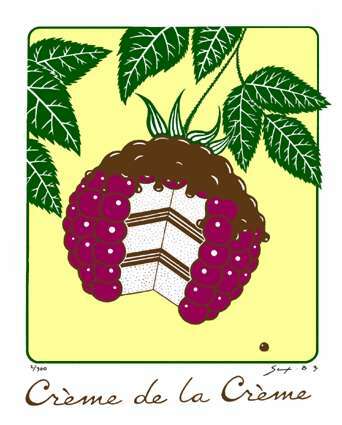 They used the freshest of ingredients and their symbol of choice for this serigraph is a fresh raspberry on the vine that has been filled by a layered cake and then covered in a rich chocolate! Fresh Cream is one of Monterey's most enduring and popular restaurants. It was started by Robert Kinkaid in 1979 with humble beginnings at 807 Cannery Row in the same building which later hosted the Sax Gallery for 19 years. After Sax had done the logo for the restaurant (which won a 1st place Sam Seagull Award), he was eager to show the poster possibilities to Robert. He printed the first image Les Fraises a la Crème' on a hand built plywood press with water based inks in his apartment with help from fellow artist, Barry Revis. 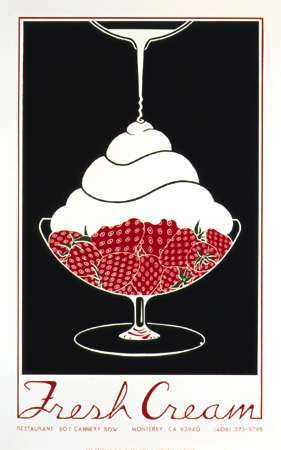 Robert liked it, and so the first official Fresh Cream Serigraph was commissioned. For a brief time, the Sax Gallery and the Fresh Cream restaurant were in the same building. Many a honeymooner had come down to have their prints signed by the artist. Unfortunately, many of the original prints were destroyed in a kitchen accident. The third Fresh Cream image features their signature dessert treat. 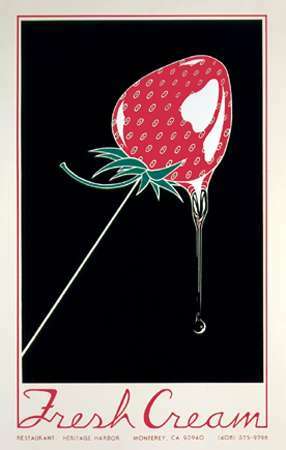 A large strawberry dipped in molten sugar. This print was commissioned to celebrate the move of the restaurant to a larger location. The artist has saved 10 complete sets of all three prints that are now available.